This time we will learn how to create a small Angular Universal CLI project that is using the WordPress REST service to retrieve and display the title and content of a WordPress blog post. Angular Universal CLI combines the Universal features like server-side rendering (see Angular 4 Universal: Boosting Performance through Server Side Rendering) with a state-of-the-art handling of Angular projects by Angular CLI. On a previous blog post, I have given an introduction to server-side rendering via Angular Universal. There, we had cloned a Universal seed file and added a REST client that has retrieved and displayed the content of a WordPress blog post. Later, I have found out that I have used a seed project that does not support Angular CLI. Angular CLI is the more modern way of handling Angular projects. In this blog post, we learn how to port (or create) the end-to-end tests and feature code to a seed project that has been created with Angular Universal CLI. With that, we have access to all ng commands provided by Angular CLI. The instructions will work on any Docker host with 2 GB available RAM. If you do not have access to a Docker host yet, I recommend following the step 0 instructions on my JHipster post. sudo chown -R $(whoami) . The universal starter comes with no e2e tests. Let us change that now. With this end-to-end test, we expect that the page on /2017/06/13/angular-4-hello-world-with-quickstart/ is displaying the title and content of my WordPress blog Angular 4 Hello World Quickstart. The [options] object will override values from the config file. See the reference config for a full list of options. We need to install jasmine reporter package.
? should display the blog title as header 1 and id="blog_title"
- Failed: Error while waiting for Protractor to sync with the page: "window.getAllAngularTestabilities is not a function"
1) Blog should display the blog title as header 1 and id="blog_title"
Executed 2 of 2 specs (2 FAILED) in 21 secs. What is it telling us? Okay, I have forgotten to start the application, before we started the test. Let us correct this now. [Sat Oct 28 2017 19:28:45 GMT+0000 (UTC)] "GET /blog/2017/06/24/consuming-a-restful-web-service-with-angular-4/" "Mozilla/5.0 (X11; Linux x86_64) AppleWebKit/537.36 (KHTML, like Gecko) Chrome/58.0.3029.96 Safari/537.36"
[Sat Oct 28 2017 19:28:45 GMT+0000 (UTC)] "GET /blog/2017/06/24/consuming-a-restful-web-service-with-angular-4/" Error (404): "Not found"
[Sat Oct 28 2017 19:28:45 GMT+0000 (UTC)] "GET /favicon.ico" "Mozilla/5.0 (X11; Linux x86_64) AppleWebKit/537.36 (KHTML, like Gecko) Chrome/58.0.3029.96 Safari/537.36"
[Sat Oct 28 2017 19:28:55 GMT+0000 (UTC)] "GET /blog/2017/06/24/consuming-a-restful-web-service-with-angular-4/" "Mozilla/5.0 (X11; Linux x86_64) AppleWebKit/537.36 (KHTML, like Gecko) Chrome/58.0.3029.96 Safari/537.36"
[Sat Oct 28 2017 19:28:55 GMT+0000 (UTC)] "GET /blog/2017/06/24/consuming-a-restful-web-service-with-angular-4/" Error (404): "Not found"
Let us assume that the protractor errors will vanish, once we have implemented the service correctly. A route to the link is missing. Let us add a route now. ERROR in Error: Could not resolve "./blog/blog.module" from "/app/src/app/app.module.ts". This will copy the lazy component to a blog component. [Sat Oct 28 2017 22:02:19 GMT+0000 (UTC)] "GET /blog/2017/06/13/angular-4-hello-world-with-quickstart" Error (404): "Not found"
That is interesting: The link /blog/2017/06/13/angular-4-hello-world-with-quickstart is reached by client-side routing by clicking on the link, but a reload of the page fails. Let us fix that now. The error is caused by the fact that we are running the service in static mode, but we have not taken any measures that the path is created in the HTTP server yet. [Sat Oct 28 2017 22:51:25 GMT+0000 (UTC)] "GET /blog/2017/06/13/angular-4-hello-world-with-quickstart" "Mozilla/5.0 (X11; Linux x86_64) AppleWebKit/537.36 (KHTML, like Gecko) Chrome/58.0.3029.96 Safari/537.36"
This is expected: we have created a static page with some dummy content, but we have not yet downloaded and displayed the content of the WordPress blog post. 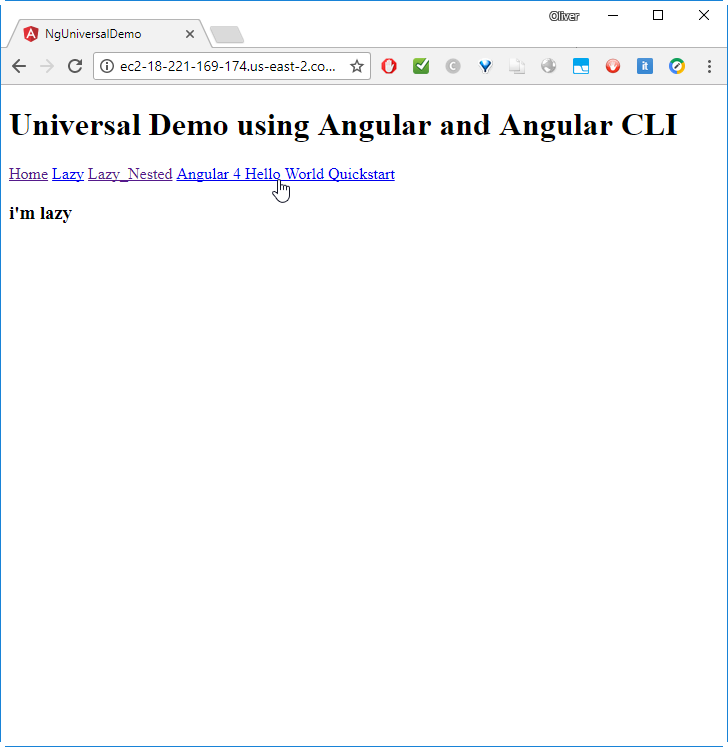 - Expected 'This is the blog title' to equal 'Angular 4 Hello World Quickstart'. - Expected 'This is the blog content' to contain 'In this hello world style tutorial, we will follow a step by step guide to a working Angular 4 application.'. - Expected 'This is the blog content' to match /^<p>In this hello world style tutorial, we will follow a step by step guide to a working Angular 4 application.'. ERROR in /app/src/$$_gendir/app/blog/blog.module.ngfactory.ts (34,31): Property 'title' does not exist on type 'BlogComponent'. ERROR in ng:///app/src/app/blog/blog.component.html (3,1): Property 'content' does not exist on type 'BlogComponent'. Now we read in the HTTP content into the variables using Observables. title : String = "Loading..."
content : String = "Loading..."
There, we have defined a private variable for the HTTP service. This service is used to create an observable with the GET function, which we subscribe to read the title and content of a single post into the variable. Moreover, we have defined the provider for HttpModule in the BlogModule part. See this blog post for a quick introduction to this concept. More in-depth step-by-step instructions including end-to-end tests can be found in part 1 and part 2 of the Behavior-driven Angular series. Executed 2 of 2 specs SUCCESS in 1 sec. This was successful, this time! The reason why we have chosen Angular Universal is its server-side rendering feature. In situations with low bandwidth to the Internet, server-side rendering helps us to provide the user with the content of the page with a much lower latency. The dynamic server __npm run start:dynamic__ has the same problems. The only difference is that the error message appears every time the link is clicked. For testing the server-side rendering, we need to access the URL directly, e.g. by reloading the page we see above (e.g. press F5) or by cutting&pasting the full URL into the browser. This is both, SEO-friendly and the content will show up much quicker on mobile devices with a low-bandwidth Internet connection compared to the client-side rendering case. We have successfully created an Angular Universal application based on Angular CLI with a REST client feeding in a single blog post from the WordPress API. We had experienced some trouble with server-side rendering, which was resolved miraculously by moving the HttpModule import from the BlogModule (the module using HTTP) to the root AppModule. At the end, we have succeeded to create an application that loads the page from the server and hands over the control to the browser thereafter. Move the REST client into a separate ‘@Injectable’ service. In order to test server-side rendering, I had to restart the server every time the code has changed. I need to find a better way to handle this in future: e.g. use continuous testing for development with client-side rendering, and let the continuous integration machinery (e.g. TravisCI or CircleCI) perform the full tests in productive mode after each GIT push. In future, I have to find out, how to write tests that will fail if the server-side rendering does not work. This time, I had to manually review, whether the HTML source contains the content. If we use Angular universal should the consuming client also be in Angular ? I have a requirement where I want to get the HTML rendered using Angular Universal but the consuming client can be a react application or a plain Vanilla application. Is this possible using Angular universal ? I see most of the examples showing in Angular for both server and client side. Your comment had some weird link in the beginning, why it had been moved to the spam folder. This is, why my answer comes so late, sorry.